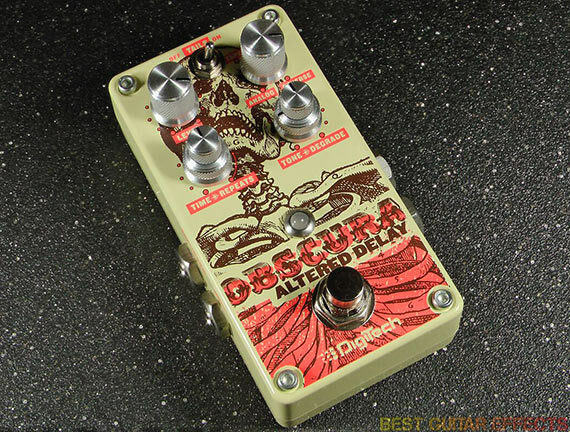 DigiTech Obscura Altered Delay Review – Best Stereo Delay Pedal Under $150? DigiTech: we all know the name. It sounds like the kind of company you expect to be a front for a Captain Planet villain’s fishy operations, but to guitarists it is the name of a benevolent industry crux. Boasting the iconic Whammy, post-2013 DOD revival, and looping solutions like the JamMan and TRIO, DigiTech is a guitar effect pedal monolith. Lately, DigiTech seems to have been leveraging their long history of gear wizardry to push their catalog even further into the boutique direction tonewise, and it shows in their latest releases. 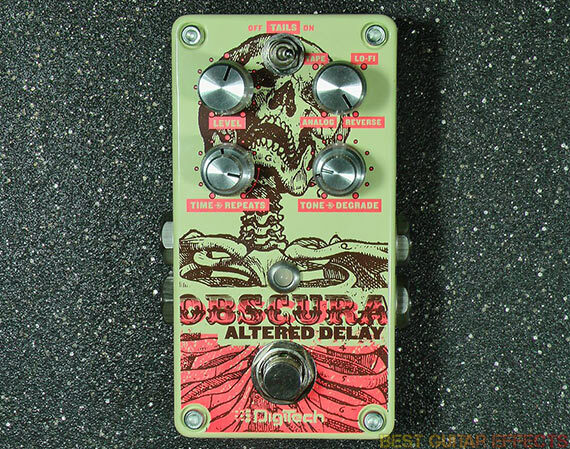 Today we’ll be taking a look at the Obscura Altered Delay. Upon opening the unassuming brown box that houses the Obscura, we are greeted by a gleefully sinister orange and brown screen print on a reflective pale yellow housing. The artfully foreboding Obscura is also artfully designed; a tiny and densely constructed enclosure sporting six knobs, two of which are dual-concentric for more available parameters to tweak. I’ve often said I’d like to see more stacked knobs on the market for the sake of conserving space, and it would seem DigiTech satisfied this urge preemptively. The stereo I/O jacks are side-mounted, and the soft-touch switch doubles as both your on/off and a tap tempo. There is also a Tails switch, handy for guitarists who’d like a choice between either muting the decay of the repeats or allowing them to subside naturally when the pedal is bypassed. For the plug-and-play types out there, the Obscura also comes with a neat little rubber block that keeps the knobs from being kicked accidentally onstage. I know it’s been said before, but what the hell; it looks like an angry little cube man, and I couldn’t be more tickled about it. Visit DigiTech for more info about the Obscura. That skeleton on the Obscura? That’s an accurate representation of who I was shortly after playing with it for an hour or two, stripped of my insulating, preconceived notions as to what was possible coming from a digital unit in an enclosure smaller than a standard Hammond box. Most importantly, I no longer doubt that a digital delay can be as oven-fresh warm as any analog module it attempts to simulate. In Analog mode, I was treated to smooth, gooey delay trails. With the degrade knob maxed your signal becomes a dirty wash of aliased repeats, made even more blendy with the tone dialed back to a darker setting. Play over this ad nauseam and you’ll never tire of the ambient simplicity you reap. The true stereo nature of the Obscura adds a dimensionality that’s lacking in many digital delays attempting to pull off analog tone. This makes it a win for those of us looking to upgrade from the familiar “black boxes” in our stereo rigs. I love Tape. The Degrade knob adds a wow and flutter modulation, just like a real tape delay, and can get into some pretty warped chorus territory. So sweet. Lo-Fi is a gritty mess of overdriven ambience floating on a bed of 8-bit repeats. The Degrade controls the distortion of the repeats via a bit-rate reducer. Great for simulating the dirty delays of days gone by. The Reverse kills your dry signal completely and spits out backwards repeats. If you’re going for the whole psychedelia thing, this is a no-brainer. The key knob here is the Time knob, which sets the length of the signal being sampled. Dial it back for a choppy, clipped sound, and dime it for long, weird whines. Also worth noting is the degrade knob’s tape saturation function, which adds vintage-style harmonic distortion to your repeats. I knew that the Obscura could pitch-shift (and boy, did I pitch-shift loudly and often,) but initially I had no clue as to the ambient possibilities inherent in the Repeat Hold feature. Crank the repeat knob past 3 o’clock and the Obscura will oscillate as loudly and as brightly as you please. With the tap tempo active, the time knob becomes a division control that switches between eighth, dotted eighth, and quarter notes, which will change the LED color from green to yellow to red, respectively. The tap is cool in the sense that the feature is there, but uncool in the sense that you have to tap the power switch twice to access it. What I’d like to see is a relay that memorizes not just the on/off status of the pedal, but also if the pedal was in Tap-Tempo mode, making use in an effects loop more convenient. I wouldn’t mention this if it weren’t particularly inconvenient for those of us who would only use it in a loop with tap tempo active. 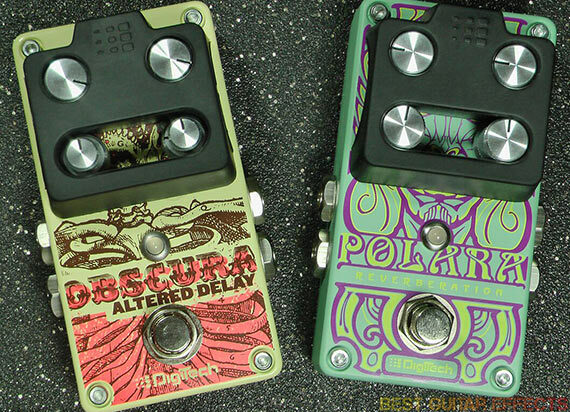 The Digitech Obscura is a great addition to any pedalboard missing a lil’ time-based juice. For those of us looking for a workhorse delay that fits a better-than-average range of singular niches the Obscura makes perfect sense for its price range; it executes the voices it aims to simulate better than most of the competition and it does it with a range of high-end features and inside of a footprint smaller than your iPhone. I think the tap tempo feature could have been better executed with a separate footswitch, but the size of the pedal makes this understandably difficult, if not impossible. Also as a matter of taste, I’d love to see optional ping-pong repeats in a stereo delay pedal. All these aside, DigiTech did a kickass job with this little guy, and you’d be remiss to ignore it. That concludes our review of the DigiTech Obscura. Thanks for reading!